Our enterprise-grade platform builds security into chatbots to boost business confidence and growth. Chatbots know your bank details; they can track your business. Bots book your travel tickets; they can trace your address. Bots serve your customers; they can check up on their history. Bots interact with your enterprise systems; they can fathom confidential information. Bots talk to people, systems and things… just imagine the power they can wield. But here’s the catch. Bots won’t talk to you, until they authenticate you. Bots won’t share anything, unless you are authorized to receive. Bots have the wherewithal to know who you are, what you do and what you aren’t allowed to do. They are designed that way, precisely. Enterprise-grade chatbots, in particular, focus a great deal on ensuring the most critical aspect of any business: SECURITY. 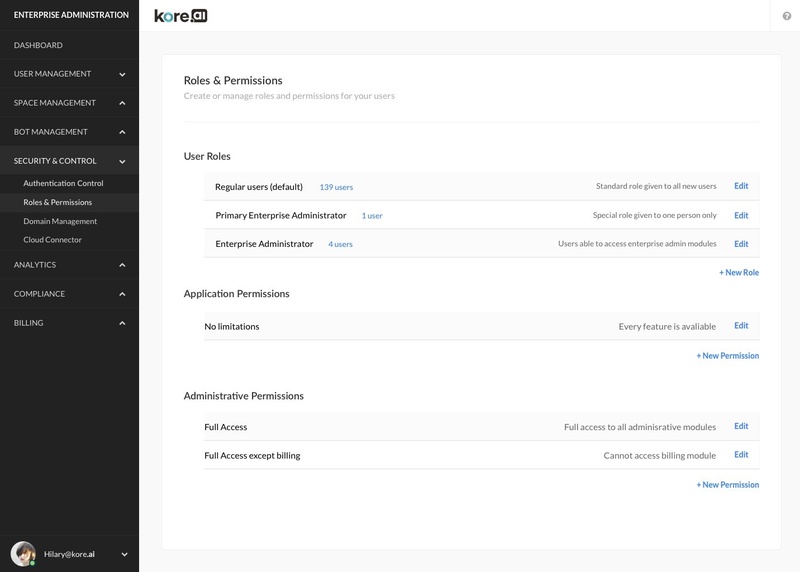 Highly secure, robust chatbot platforms like Kore.ai’s go to great lengths to assure your business is safe. Bots deliver proactive alerts. So, they know what you are up to – meetings, travels, bookings etc., by following your work patterns and life styles. They have access to the applications you use and devices you access because they live in the communication channels you maintain. Bots take actions. They update systems of records on your behalf. Bots fetch reports and display information. Bots browse knowledge bases and support customers with resolutions. Bots work through multiple systems and perform complex workflow tasks. Bots carry your data, sometimes sensitive and confidential. To perform all the above tasks with efficiency, the bots must be designed with data security on top of the mind. Enterprise teams need bot platforms to support single sign-on features, including industry standard integrations such as, SAML (OKTA, Onelogin, BITIUM), WS-FED, Ping Identity, OpenID Connect etc. 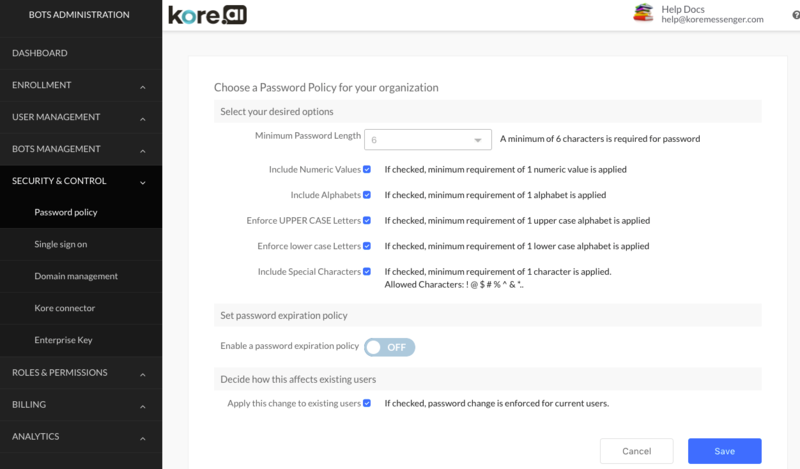 Configurable password policies: The platform must provide chatbot administrators the ability to set up default password strengths and dual-factor authentication options. Integrated system authentication: The platform must support authentication mechanisms such as basic auth, oauth, or API keys to authenticate users before bots can deliver alerts or take actions against integrated systems. The conversations humans have with bots must include secure messaging features with AES encryption to protect bot data at rest and in transmission. Latest cipher suites must be available to encrypt all data between channels and servers. Cryptographic keys encrypt all the data at rest while on cloud. The enterprise must be able to operate admin access to encryption keys with complete visibility of messages, regardless of communication channels such as websites, mobile apps, email, SMS, messaging. Redaction options provide the ability to mask sensitive data and protect personally identifiable information. Bot building platforms must support deployment models to include cloud and on-premise systems. Connectors must be available to run behind enterprise firewalls and facilitate secure data exchange while maintaining compliance with information security. Cloud to on-prem connectors must support streamlined installation, persistent TLS connection, scalable load request handling, and X.509 based authentication etc. Compliance can be achieved through strict adherence to federal regulations for HIPAA, PCI, FINRA, SOC 2 etc. and standards applied to retain, monitor and manage bot messages. All system activities must be automatically monitored including events related to security policy changes, SSO enable/disable options, cloud connector, password policy, user management, user profile updates, bot activities management, changes to roles & permissions etc. Secure administration of bots and user on-boarding plays a significant role in implementing security. The platform needs to provide ability to control component access to users, approve/reject bot deployments, including at the task level, assign users to designated bots etc. 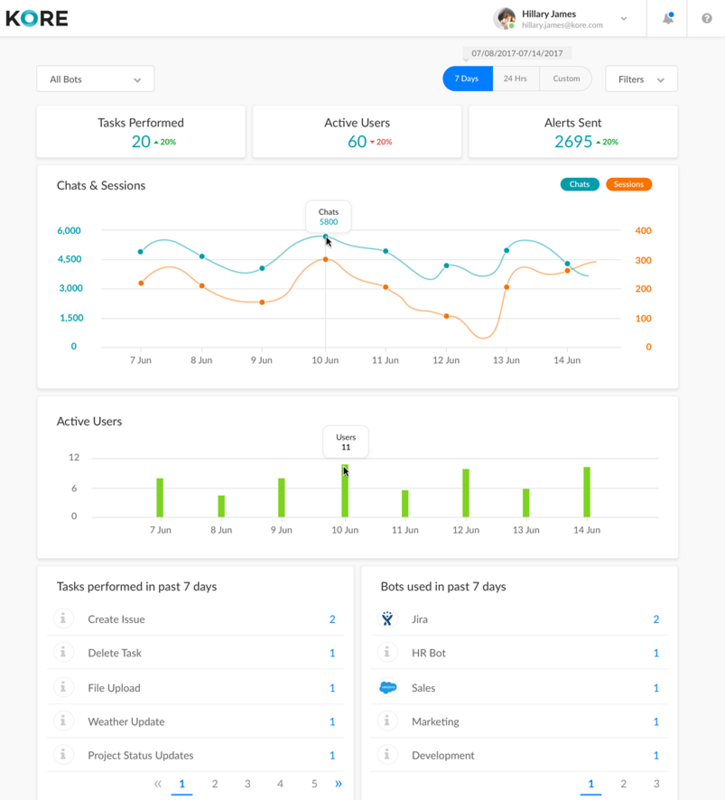 A central dashboard to view all bots, users, tasks, trends, hand-offs etc. is a valuable tool for centralized monitoring and control. Security must be built into the development life-cycle, including having practices for penetration testing, data center security, network security, vulnerability management, intrusion detection, security incident and event management (SIEM) etc.